I've gone all vintage for Case File S365-4 over at CSI this week. 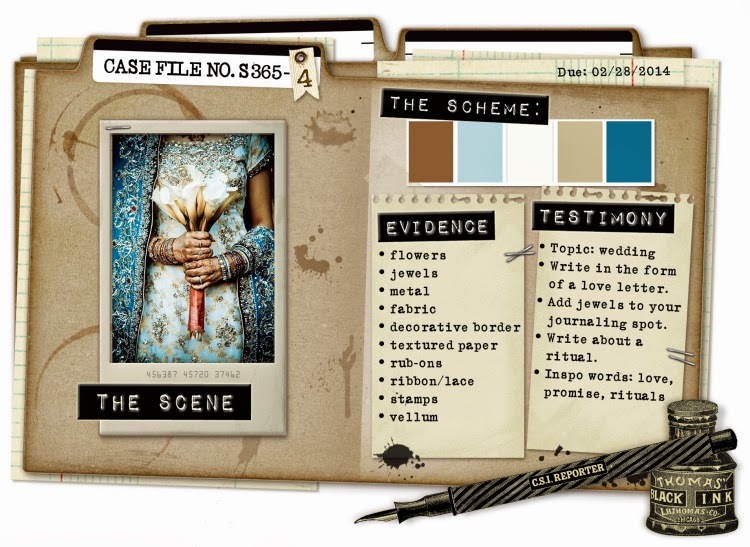 This is one of a series of Case Files created by CSI mastermind Debbi Tehrani to be featured in Scrap365 magazine, so it's extra exciting! Debbi has found this gorgeous image to inspire us - from here, she has taken five colours for the Scheme and ideas for design elements and journaling prompts. This was a blatant scraplift of a gorgeous page by the amazing Finnabair - click on the link to see it for yourself, she is such an inspiration! Scheme: the colours are all there, plus some neutrals. Evidence: flowers; jewels; metal; fabric; textured paper; ribbon/lace; stamps. 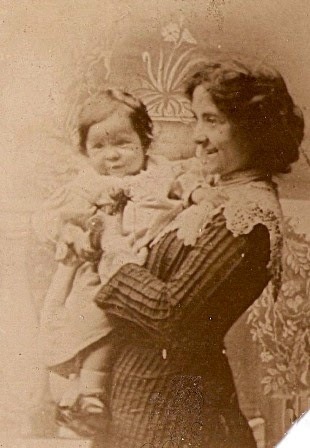 "This photograph shows Eva, Great Granny Robinson to me, holding a baby Grandpa in her arms, circa1910. Eva was always quite mysterious about her roots and I am still working on finding out more about her story. We know that when she was 24, she met the handsome Archibald Miller Robinson whilst he was stationed in India with the British Army. They fell in love, married and had five children who were all born in Calcutta. When this picture was taken, the future was full of promise. This was around the time when Eva came over to England with the children, to be joined by her husband later. It must have been a very difficult time for her, especially being of mixed race in English society at that time. Sadly, their daughter, Annie, was to die from rheumatic fever in 1918, but all the boys went on to have children and grandchildren of their own. Eva died in 1942, so I never met her, but I bet she had some amazing stories to tell ..."
Two kinds of stamps here - some stamping with Distress Inks around the edge of the page and two vintage Indian stamps from my husband's boyhood stamp album (I do have permission!). Under the stamps are a piece of tulle, some Magic mesh and a scrap of gauze coloured with ink. The ivy leaves were punched, inked and crinkled to look more realistic. Burlap flower by Maya Road and a flower cut from a length of trim (part of my haul from Walthamstow High Street). The metal watch charm was dabbed with Distress Paint to tone it down a bit. The oval piece is Stamp Board - I decorated it with a sheet music stamp and inked the edges. There is a tiny cluster of pale blue pearls tucked in between the flowers. The background has some lace and houndstooth stamping with Distress Ink. Assorted scraps of patterned paper were distressed, inked and layered up with pieces of mesh, gauze, doilies and more of those Walthamstow trims! The chipboard scroll was painted with Distress Paint then inked to tone in with the page. The tape measure was stamped onto a scrap piece of woodgrain paper. A tag sticker from Papermania was stuck first onto cardstock then adhered with foam tape. Creating the background was great fun. I started with a sheet of some gorgeous Mulberry-type paper, which came from a shop in Camden Lock market. It's very soft and pliable, almost like fabric, with little dried petals in it. After spritzing it with water, I splashed it with inks, then dried it with my heat gun before stamping and inking around the edges. It needed a bit more body to cope with all this and hold the weight of all those layers, so I stuck the whole thing to a sheet of cardstock for stability. Well, that's it, what a lovely time I had making this - why don't you have a go? Check out all the other Design Team pages at CSI and have a look at the CSI feature in Scrap365 for plenty of inspiration.